I thought I’d hop on here real fast and give you a few nursery updates. We are T-minus six weeks and counting until this little girl arrives, and finally we are making some progress on her room. I know from experience that she likely won’t be sleeping in here for a while after she’s born, but that also means I won’t be sleeping for a while after she’s born so I’d rather get this marked off the to-do list ASAP! If you follow me on instagram then you already know that J got the crib assembled last week, and I couldn’t be happier with it. I fell in love with the Heidi Klum Truly Scrumptious Crib from Babies R Us before I ever found out that I was having a girl. Once it was confirmed she was a she I knew this was the crib I wanted. 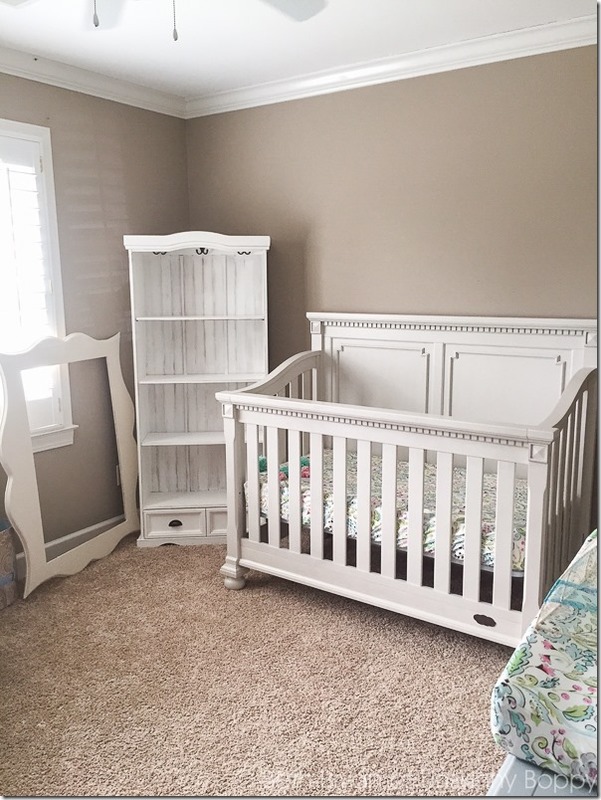 It’s a classic crib with clean lines in a pretty greige color but it’s very feminine and pretty. It will convert into a full size bed just like Garrett’s crib, so I expect this to last her til college at least! I found the bookcase in the corner at Easy Street Resale, a local consignment store. If you live in the Birmingham metro be sure to like them on facebook and go check out their shop in Pelham sometime. They have so many cute pieces of painted furniture! This bookcase is petite at only 65” high, but perfect for that corner. We will get it anchored to the wall once we have painted the room. Speaking of paint, here are my paint samples that I’m trying to decide between. All of them are from Behr at Home Depot. They are all in the light grey/blue family which is tricky since I’m working with light grey/blue painted furniture along with the greige crib. I’m pretty sure I know which one I’m going to choose, but I wanted to see what you thought about it? Which do you prefer? 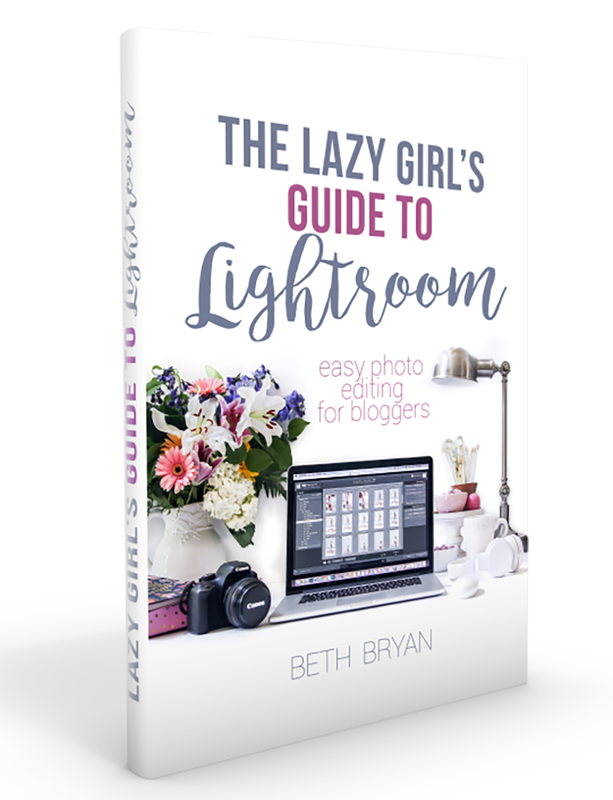 Now, you’re probably scratching your head and going “But Beth, where is the PINK? Isn’t this a little girl’s nursery?” Well, yes it is. But the thing is, I’m not really into pink. I’m much more of a blue kinda girl, even though I avoided baby blue for Garrett’s nursery (and went with a red/brown woodland theme instead). I do have some pink scattered throughout, like the Love Bird damask crib sheet and changing pad cover that I found at Carousel Designs. I will pull in a few other pink accessories as well, but for now, I’m loving the calm colors of the blues. That’s my goal for this nursery- calm with no eyeballs. G was scared to death of all the eyeballs on the stuffed animal head we had in his nursery, so I’m implementing a zero-eyeball policy for as long as possible. So far this is the only stuffed animal I have bought for this girl. 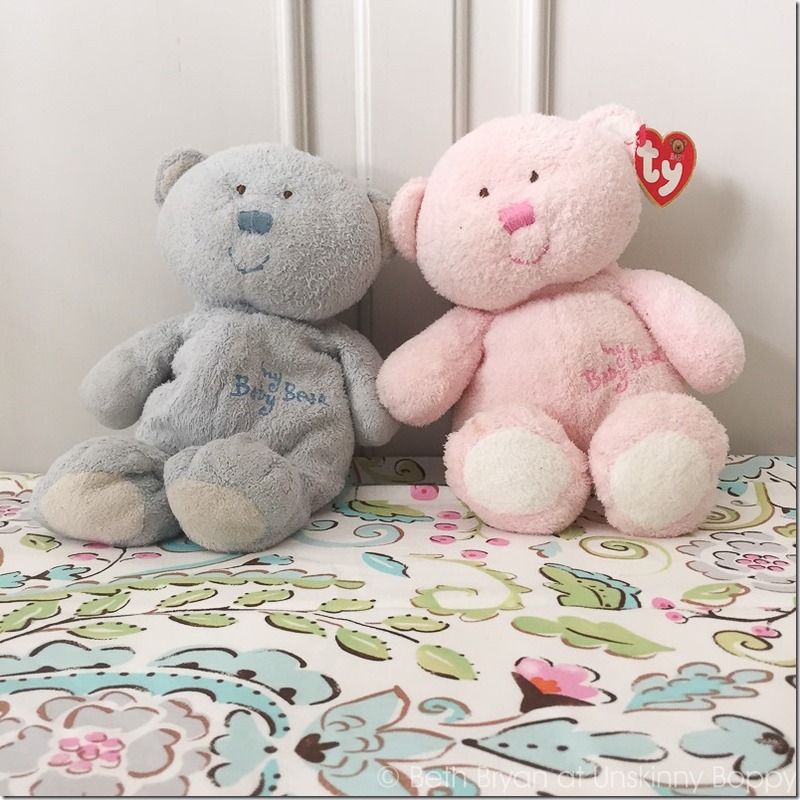 My dad bought the blue bear for my G on the day he was born. “HuggieBear” is well loved after seven and a half years of nightly snuggling. G asked me to find a pink one to give to his new baby sister so she can have a snuggle buddy, too. I finally found this pink one on eBay, so I’m putting it into his big brother basket to open at the hospital. Ahhhh, I cannot wait to see these two kids of mine snuggling with their huggie bears side by side in August. 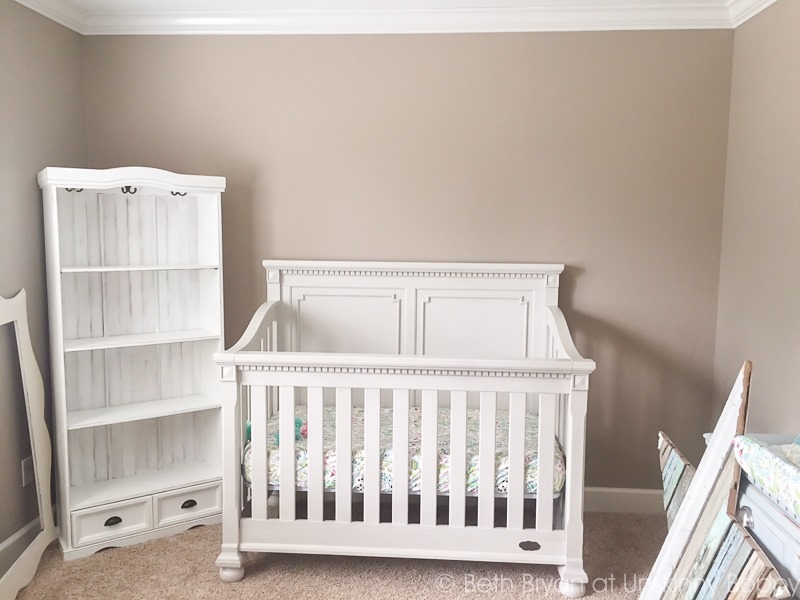 We plan to paint this weekend, so check back for more nursery updates soon! PS- Thanks for the concern about lead paint in the reclaimed wood star. 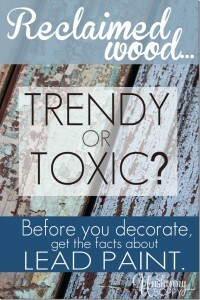 I wrote a whole article about the hazards of lead paint in a post last year called Reclaimed Wood: Trendy or Toxic. We will be sealing the star with a few thick coats of clear sealant to make sure no paint chips make their way into baby girl’s mouth accidentally. I also plan to hang it high out of reach where she cannot touch it, so no worries! Disclosure: I was provided product by BEHR and compensated to write this post but the thoughts and opinions expressed are my own! Love her bed! Gentle Rain complements the wood pieces, and the sample probably looks more pinkish because it’s on the taupe wall. But if you’re not into pinks at all, Manhattan Mist is my next choice of your colors. As a lover of blues, too, I would consider a light lavender-blue/periwinkle. I spy the most awesome star ever, perfect for a nursery. I’ll stay away from offering any wall paint advice, my track record at picking paint color is not so good so what ever color I like should be the one you don’t use, because even I won’t like it once it’s on a wall. Six weeks till I have to boil water, wow it goes fast when the bump isn’t in one’s own belly. Oh how exciting that you are having a girl. I love that bed you went with…great lines. I love the bedding!! My favorite is 3. Light French Gray(the one in the middle). On my screen it looks fresh and perhaps a little more blue/green? With such a floral, it looks like a garden. Such beautiful choices … your taste is impeccable! Disregard my previous question about the table. I should have read other comments first! Congratulations on your soon to be here baby girl. How very exciting. I love the crib you choose. The styles really have changed since my guys (16 and 21) were babies. Her My favorite for the wall color is #3. I love those little bears and that your little guy wanted his sister to have one is too cute. 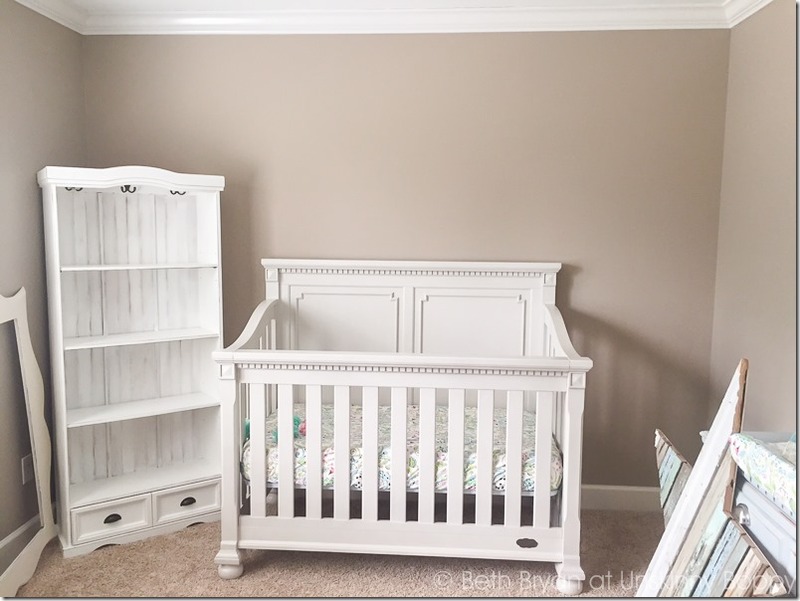 Her nursery is going to be perfect. What an amazing time this is for you and your family. I remember the feeling of euphoria being blessed with my a daughter, then seeing my husband with a baby girl of his own sent me over the edge. Add on top of that getting to watch our son’s suddenly become young men with a little lady in the house to protect, man… Get a tissue girl, this is big! My vote goes for #3 light french , looks soft, fresh and versatile. The nursery looks great so far! I really like the first paint on the wall. The crib is so pretty. Good luck with everything and thanks for keeping us posted. Those are all great paint selections. I actually like the color of the walls as they are. I think it really makes the light furniture pop. I can’t wait to see your choice. it will look great. You’re so talented. 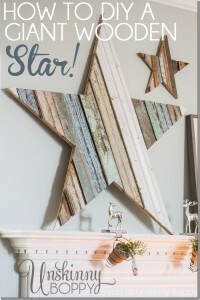 I absolutely love that distressed wooden star! I love that you didn’t go with pink on pink on pink! She’s going to be one classy baby, and grow in a space that will grow with her. Beautiful choices you’ve made all around, though I have to admit I sort of like the earthy color of the current paint color… You have vision though – I’m certain it will look even better once you’ve got it painted! Gentle rain is so pretty. I cant wait to see your finished nursery. 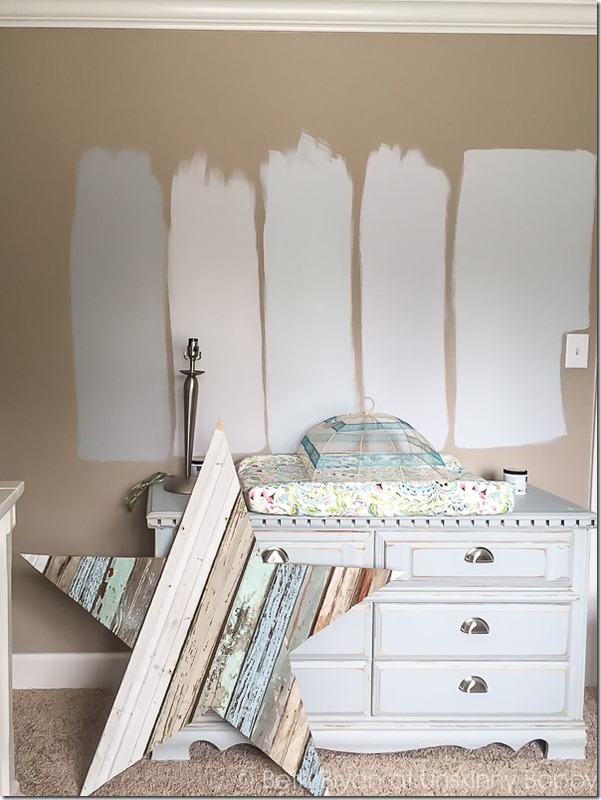 Would you happen to know what color you painted the room before hand? The tan color.